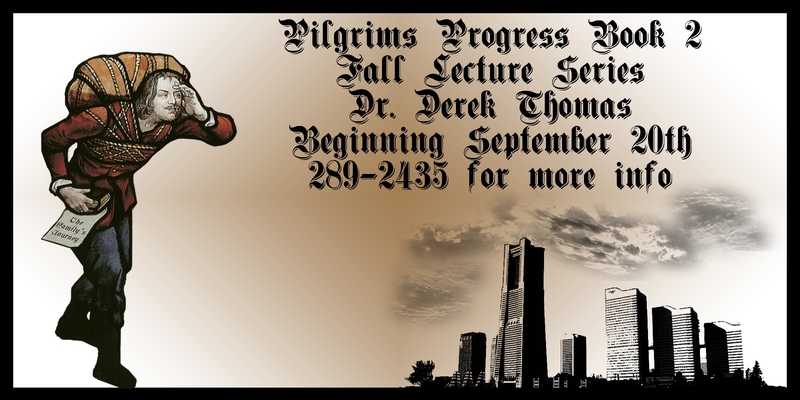 This fall, Dr. Derek Thomas will spend six Thursday evenings lecturing on the second book of John Bunyan’s Christian classic, Pilgrims Progress. Book two is the story of the journey of Christian’s wife, Christiana, and four children from the City of Destruction to the Celestial City. It remains a moving and vivid allegory of Christian pilgrimage. Everyone is welcome. There is no cost though an offering will be taken up on the last evening. A nursery is available for children age 4 and under by reservation (289-2435). Originally from Wales, Derek Thomas is the John E. Richards Professor of Systematic and Practical Theology at the Jackson campus of RTS. After pastoring for 17 years in Belfast, Northern Ireland, Dr. Thomas returned to the USA in 1996 where, in addition to his work at the seminary, he serves as the Minister of Teaching at First Presbyterian Church in Jackson. In addition to serving in the pastorate, Derek has served as editor of the Evangelical Presbyterian, a monthly denominational magazine. A graduate of RTS in 1978, he gained a Ph.D. from the University of Wales, Lampeter in Calvin’s preaching on the book of Job. He has written or edited 15 books and has contributed to commentary series by Banner of Truth and Evangelical Press. He also co-edited Give Praise to God: A Vision for Reforming Worship, (P & R) with Philip Ryken and Ligon Duncan. In 2004, Derek Thomas became Editorial Director for The Alliance of Confessing Evangelicals and the editor of its ezine, Reformation 21 (www.reformation21.org ). His interests include the music of Richard Wagner, Anton Bruckner, and Gustav Mahler, and he has a passion for good coffee and blue cheese! He has been married to his wife, Rosemary, for almost 30 years. They have two adult children, Ellen and Owen, a dog called Jake and a cat (with feline attitude)-Maxamillian Beauregard!